It was probably with the letters of St. Paul that the fusion between Lucifer and Satan had become complete. The interpretation of the spirit in Job 1 and 2 and the consequently identification with the spirit mentioned in Zechariah 3 created a total fusion between Lucifer, from lux + ferre, bringer of light, and Satan. The names where understood to refer to the same being and when we reach the 14th Century they both where also referred to as diavolo.. This symbiosis occurred partly because of lack of distinction in translation, theological dogma being fused and historic necessity. In Job 1: 6 we read: ”Now there was a day when the sons of God came to present themselves before the Lord and Satan came also among them”. In Zechariah 3; 1, we read: “And he shewed me Joshua, the high priest standing before the angel of the Lord, and Satan standing at his right hand to resist him”. The scenery in Zachariah 3 is a sort of judgment regarding Joshua’s right to be anointed to priesthood or not. One can of course make a parallel to the anointing of Jeshua ben Joseff in this regard, where the devil is constantly challenging his right to be “Christened”, which means anointed after “chrism”. In Job the issue is of a theological nature expounding the dilemma of the need for a moral order in the creation and especially the conditions for worship. The question these two verses pose is whether Satan is a spirit being or if it is simply speaking of an office. In both instances Satan is presented as someone who questions the validity of either Jobs reasons for worship or Joshua’s right to the priesthood – someone who challenges, quite similar to the prosecutor in a trial. Looking at the root of the word Satan it is revealed that the word it self is most likely a noun, derived from the Hebrew sâtãn. This word is subject to some variations in internpretations as it can be constructed from the Hebrew root sth, meaning “to stray” or swt, referring to “fall away” or the act of revolt or rebellion. It can also be derived from the root sth, meaning “to seduce”. If one assume that the additional “an” is a suffix the word it self, satan, is an abstract noun. However, the etymological roots are unclear. It can be that the limited reading of the etymological root of satan resulted in the figure of Satan be subject to the qualities of these root words. However, if we add the additional n or nun matters tend to change and we have a name with fuzzy etymological roots. P.L. Day suggests that the meaning of the name is better discerned from its occurrences and context in the scripture, given that the common meaning of the noun is “adversary” both in terms of the Hebrew satan and the Aramaic satana. This Hebrew word was substituted with Diabolus, slanderer, and Ho Satanas, referring to Gods opponent as the holy scriptures was translated into Greek and Latin. Satanas and Diabolus became accordingly used as a reference to the same supernatural power. It is interesting to note that outside the Hebrew scriptures there is no other reference to the use of the word satan, which could suggest that the word it self was created to serve some kind of meaningful purpose. The question is; what kind of meaning would this word serve? Maybe the word was derived from the Acadian legal system where there are found three types of office, all of them translated into “accusers”. These offices were referred to as bêl dabâbi, bêl dini and akil karsi. These terms were used to designate legal opponents, either celestial or terrestrial and can be seen as representing the same contextual meaning as what is found in the use of the noun satan. This would indicate that, in spite of lacking an etymological relationship, there is a meaningful relationship based in historicity. One example given by Day is in a reference to the use of the deities Nanay and Mâr-Biti in the legal system. Oaths where sworn to these deities and if the accused one turned out to be a liar he had to answer to the wrath of these deities. Note that in the Acadian legal system the celestial council was an integrated and supreme part of the legal system and served important functions in the prosecution it self. One can speculate if the present custom of swearing on the bible is actually a remnant from this practice of swearing on the name of wrathful deities. If so, it means that ones oath made upon the bible is actually an act that can bring about a curse from the celestial court if oaths are broken or one is found to be untruthful, thus one is inviting the confrontation with Satan. Returning to the challenge in the case against Job we see that the word used for the accuser, according to Day, is hassatan, a common noun meaning “accuser” – which is a word used in legal references. Given the definite article of the word, it seems highly unlikely to be a name and thus a position. A similar role is found in Numbers 22, where we find the story of Balaam and the donkey whose mission is hindered by a hassatan, in a reference either to Jahveh him self or one of his divine messengers. This means that this “satanic office” is administrated by God himself. The role described is similar to what is happening in the case of Joshua, who also is challenged by his hassatan. This would indicate that choice and aspiration on the path will at all times be challenged by a spiritual entity aiming towards making us strong by presenting the poison of insecurity and corruption. Thomas Aquinas comments in this regard interestingly enough in Summa Theologica: “Further, scandal denotes an obstacle which is put in a person's spiritual way. Now even perfect men can be hindered in their progress along the spiritual way, according to 1 Thess. 2:18: "We would have come to you, I Paul indeed, once and again; but Satan hath hindered us." Therefore even perfect men can suffer scandal”. As such, the role of hassatan is often leading to the understanding of the deity occupying this office as being “against man”. Truly it is more a lack of understanding of this office and how it is related to our spiritual and moral growth that is escaping our awareness than some sort of evil inherited in the office. To turn to modern day legal references, the prosecutor or accuser in a trial at times suffer the same interpretation – as being degenerated, perverse, evil, in spite of the prosecutor actually is only doing his work, the task assigned to him by the government. One can say that, in the same way we have the right to a defense - we also have the right to be accused. The Greek word diabolus refers to “a slanderer” or “attacker”, in a abusive and vulgar sense, unrelated to a legal office and then successively in translations of the Bible after Vulgate the diavolus and daemon (which were separate terms in Vulgate) became fused and seen as synonymous with each other. The office of hasatan was reinterpreted from being a legal function to be an expression related to violence from a meaningless mob. The meaning however reappeared in the term advocatus diaboli, in the mid 17th Century in the Vatican as a reference to the one who were assigned the task of speaking against the canonization of a candidate for sainthood. So, how did Lucifer became associated with the role of Satan? The explanation is quite simple. The reference in Isaiah 14: 12 regarding the fall of Lucifer and his angels became equated to be one and the same as with Satan or diavolos, now being identical with the enemy of mankind, the Devil. There is a lack of meaning both etymologically and in contextual use in this regard - a difference that perhaps was breached by equating Phosphorus which in Hebrew is translated into – or from Helel ben Shahar, the same as Lucifer. Thus the rebellious spirit who stole the light from the gods was equated with Lucifer and they both considered as Gods antithesis and not as divine accusers in a celestial court. Lucifer, the angel of light, due to his symbiosis with Phosphorus was imposed the nature – or shall we say office of Ho Diavolo rather than hassatan and with the battle against the heretics of the Church, they became assimilated totally with the needed adversary of God. Within short time the more and more diabolic interpretations of Aquinas theology Lucifer-Satan became the fallen angelic genii that would manifest the antichrist. The term angel is from the Greek angelos meaning “messenger”, which in turn is translated from the Hebrew malakh, which also means “messenger”. In both cases it is a reference to spirit being in the court of god with specific tasks in the celestial government. Lucifer is accordingly the messenger of divine light, but given the association with the angelic rebellion and fall, his light was considered corrupted and diabolic. The same fate befell the Philistine god worshipped at Ekron according to 2 Kings 1:2, Belzebub. The name is probably a contraction of the name Baal Zebub, meaning the “winged Lord”, but the deity became demonized by the Hebrew tribes into being a gigantic evil minded fly. This misrepresentation was perhaps done because a celestial being with wings could be taken for an angel - a messenger of god, something that would be highly improper. Since the word zhebub also could refer to a fly as much as a winged being the transition from angel to supernatural fly was with ease done. 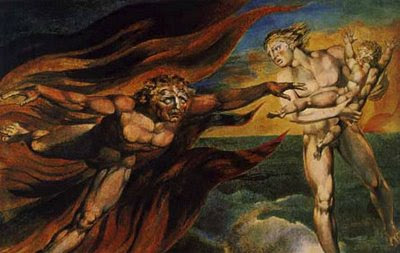 In the same way the Pauline letters bring back meaning found in the etymological Hebrew and Acadian root of what became the name of Gods opponent, Satan, as an accuser and thus combined with imagery amongst the Hebrew prophets one would understand Satan to be the fallen and evil angel, jealous, corrupted and hateful, Gods adversary and mankind’s enemy. Certainly there is much food for theological speculation to be taken from this quotation but it is in the scope of this little essay the transformative aspect that is interesting. Thomas says that it is not a dangerous error to take “a wicked angel” who present him self as “a good angel” for being good. I would suggest that this remark is made because of the transformative process it self. An angel transformed into light is light. This transformation can perhaps be seen in the scope of a seeker who has made a successful exit from his challenges on the path of light. He has been found victorious in the “trial” and has thus by wisdom and insight rejected the Kakodaimon (bad angel) in favor of the Agathodaimon (good angel). By reminding that the celestial image of Kakodaimon as well as Agathodaimon is the serpent it can indicate that it is in the context of a celestial court one should perceive the office of hassatan. As such, one can envision that the condition is truly like in the case of Joshua. On one side sits the good angel and on the other side the accuser. Together they constitute a divine balance and present you with choices to act according to guidance of ones good angel and thus walk ones destiny. The accuser will at all times challenge your choices – for the sake of making the light luminous for you, at least if the format of understanding is related to Lucifer hassatan, this will for sure be the aim of our accuser, to make the light luminous or perish by the path it self. Aquinas, T. (1273). Summa Theologica. Day, P.L. (1988). An Adversary in Heaven; sátán in the Hebrew Bible.